Hi, my name is Kolja. I am 19 yeas old and I just finished my high school examn in 2015. This year, in the beginning of 2016, with the support of helpucation e.V. I had the great opportunity to travel to Cambodia and visit the AKC as a volunteer. Here is what I experienced. Unfortunately a homestay in Samrong as a foreigner is not allowed yet so I lived in Siem Reap, one of the biggest cities in the the country, which is well known for its vibrant traveler scene. The Angkor Kids Center is located 45 minutes drive from Siem Reap but fortunately Samnang organised a friendly Tuk Tuk driver, Proy, who drove me to the AKC. I enjoyed it every time, because for me it was interesting to observe the local people and to enjoy the landscape by driving past. Nevertheless this distance is an effort and complicates volunteering. The lessons in the AKC take place in the evening, so every day I arrived at AKC around 5 pm. At this time, many children play marbles at the playground or on the area around the AKC. The lessons usually start a bit later when the teachers arrive at 5:30 pm. On my first day there the children didn’t notice me, they were so much preoccupied by their games. It was a pleasant atmosphere. After the arrival of the young teachers, I had a friendly conversation with them about my journey and me in person but also about their lives. Most of the teachers are still students in other schools. They teach after that in their free time as volunteers. The classes with the younger kids were very loud. 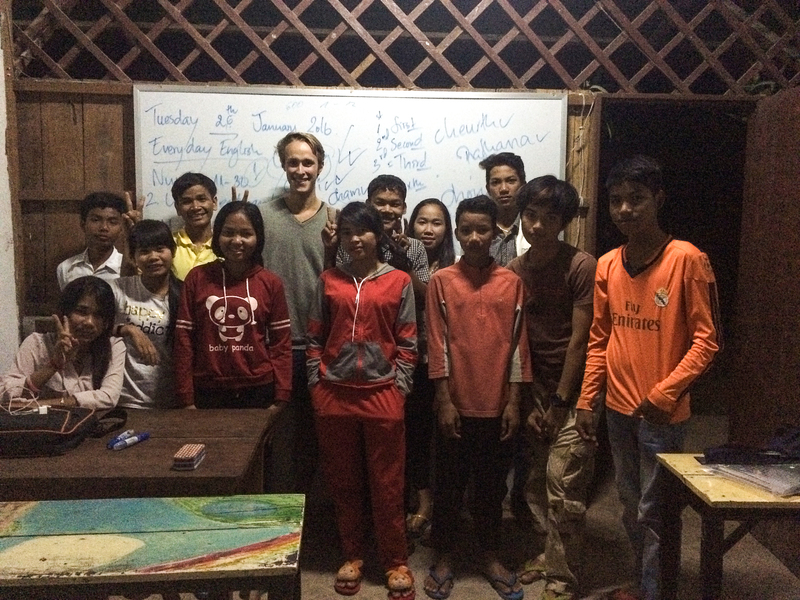 Almost 40 children and one young teacher who gave his best to teach them in English. It was all about the pronunciation: The teacher spoke out a word loudly and the class repeated it screaming. You can imagine that the lessons were quite vivid. Unlike the lessons for the older ones. Especially Phlom did very serious and good teaching. It was a pleasure to talk to his class on a high level. I told them things about Germany and my live and they gave me an insight into their lives. It was a very open and kind atmosphere. I stayed for two weeks in Siem Reap, worked together with Samnang, with the teachers and the children and joined the “fence-project“. It was a great time and I was sad to leave this place. But I carry all the nice experiences with me. Until today it makes me happy when I think about that I’ve been at the AKC. let us bring you with more inspirational stories of our team success. 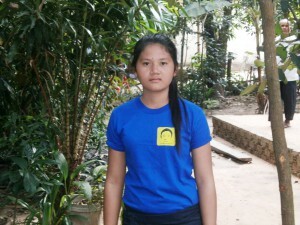 Ms. Sreymom KROM, a 21-year-old girl who has spent her time volunteering at Angkor Kids Center in her hometown since 2009 with helping kids to learn English and other work. 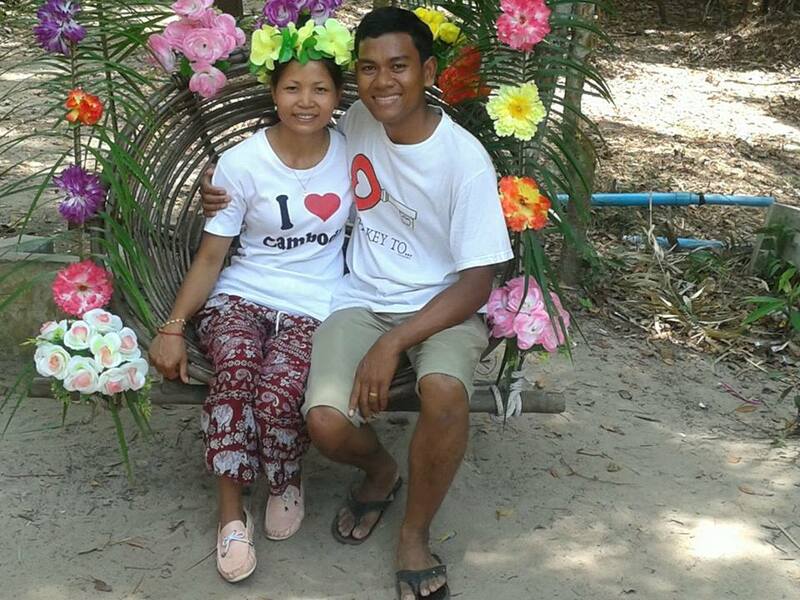 After finished her high school in 2014, Sreymom started to work in some shops and small local restaurant to gain experience during the day time and getting back to help AKC in the evening. To the commitment, effort that she has spent helping her community and to the general humanity in greater word, she deserves to have something back for her better life. In the awareness and the recognition of team effort as to which AKC mission is driving to, word reaching the sense of our dear donor, Linkforaid and they agreed to look for fund to send her to a vocational training school in tourism which is the only best way to get the job right after one year, if the performance of the student / apprentice is well. When a positive light is coming to her, the bigger bright is heading; as of June 2015, Sreymom has successfully applied for a job working in one of the luxury cruises on the vessel up and down stream between Cambodia and Vietnam. Let’s Congrats and wish her for the bright future ! At least but not last, thanks to Mrs. Salet NHY, who is our core inspiration to have a great influence on the community for being a model and promote the trust and confidence of AKC team to the working environment, without her, there might be no Mr. Sophal Chhuo started working a cruise a few years ago, and today Sreymom on this good job. Salet is our supper reference ! Thanks for your time and always be with us, come back here frequently and Follow Us on Facebookpage to get the inspiration for better tomorrow together !